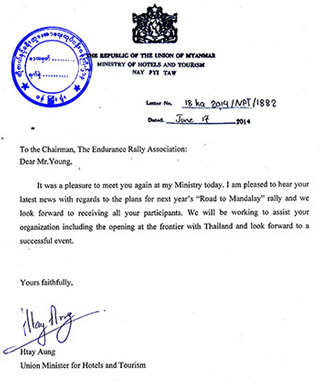 Immediately after the very successful 1st Alpine Trial Philip Young flew to Myanmar for high level meetings with government officials to confirm arrangements for next year’s Road to Mandalay Rally. Philip's visit was to finalise details with Government officials in Nay Pyi Taw, the Burmese capital. The officials in the Ministry of Tourism have been working hard behind the scenes to provide the best available facilities and to ensure our smooth transition across the border from Thailand to Myanmar – our event will be the first sporting rally to cross into their country. The Minister of Tourism met Philip in the government office where officials presented a thick wedge of paperwork, our official Permits for the event, all written in Burmese, and over a cup of tea, a covering letter was typed out in English. 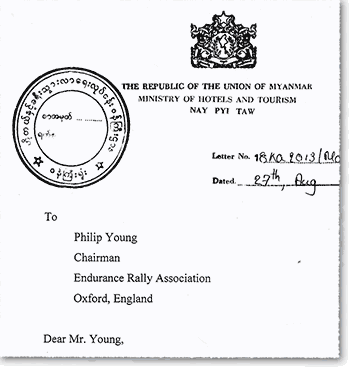 Photographs were then taken for the various Burmese newspapers – our event is seen as ground breaking by the Government, bringing rally-drivers from all corners of the globe to their country with a physical crossing of their border in a demonstration of how Myanmar is opening to the rest of the world. This latest personal visit by Philip follows on from a succesful final reconnaissance of the route in April and May. After shipping an ERA vehicle from the UK, Clerk of the Course John Spiller accompanied by Anthony Preston completed a full and detailed route survey for the whole event. They drove out of Raffles Hotel in Singapore on 15th April and spent very nearly a month on the road before reaching Rangoon on 11th May. Travelling with our local fixers, John and Anthony met nothing but a friendly and enthusiastic welcome throughout the drive across Malaysia, Thailand and Myanmar. They have lined up some fantastic driving roads, as well as meeting those who will be closing roads for us to run Time Trial and Regularity sections through plantations and over other interesting roads. Recent contacts with our agents in Thailand assure us that the political situation is quickly stabilising and should not present any difficulties for the event. As always the ERA will take every consideration for the participants safety and enjoyment. Philip Young reports back on his second route-sorting mission to Burma, visiting Government officials, checking out the best hotels, and coming away with written confirmation that high-level assistance will ensure the border crossing from Thailand – a major first – will see rallycars drive across the frontier, and on to Mandalay for the very first time. Sitting in front of the large desk in a busy office surrounded by cardboard boxes stacked high with paper rather felt like home from home, and not unlike the Rally Office back in East Hendred. Except this was the office of Myanmar’s Chief Secretary to the Cabinet Minister in the Ministry of Hotels and Tourism, and it had just started raining. So heavy was the thunder, voices had to be raised. The racket of the sheets of water falling on the corrugated iron roof above our heads from the sudden monsoon outside was even more deafening. Half an hour later, an assistant was despatched to go and write our first letter of welcome – and soon the men from the Ministry were smiling and looking very relaxed as maps were finally being rolled up and put away. Shaking hands all round, it had been a very helpful and positive meeting. Next stop, on to the Minister of Sport’s office. I spent three days in the capital city of Naypyitaw in order to set out our plans with officialdom – my previous visit (see below), had been meeting Ministers, Deputy Ministers, Governor Generals… this time, I wanted to spend time talking to senior civil servants, those at the sharp end of decisions who actually make things happen. I spent time in Rangoon (Yangon), Naypyitaw, the new capital city, and then on to Mandalay, and then discovered quite by chance one of the finest hotels I have ever experienced, in an out of the way place south and west of Mandalay, in the small town of Bagan. Here, my hotel was surrounded by over 2,000 temples, all built in the 11th-Century, with my room overlooking several of these fascinating relics, reflecting long shadows in a lilly-strewn lake just outside my bedroom window. I had arrived just as the sun burst through the clouds to produce a dramatic sunset. This was the end of a great day, having driven down a very narrow strip of bumpy tarmac, and with a Gordon’s gin and tonic in one hand and the camera in the other, rally-recce days don’t come much better than this. I travelled around Burma for eight days, not just walking up and down endless Ministry corridors, but checking out the hotels on offer, to personally ensure our overnight hotels really are the best in town. And also to drive some of the more rural roads. I packed in over 2,000-miles of travel, and not all of this was behind the wheel of a 4x4. I travelled by a Dakota-sized old plane... it must have been old, it had propellers, a 30-year-old Datsun taxi, an even older bus... Rangoon’s buses look like they have escaped from the Oxford Bus Museum, an old and very leaky wooden rowing boat, in order to photograph the famous mile-long teak bridge at sunset, said to be the longest wooden bridge in the world, and, you are not going to believe this... but I will give it to you anyway, I even hitched a lift on a seat made from a pile of freshly-cut grass perched behind a bullock’s backside in a wooden-wheeled ox-cart. Travel in some parts of Burma hasn’t changed for over 1,000 years. 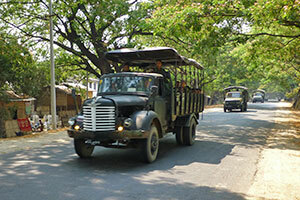 This, then, really was a recce-trip all about getting down to exploring the real Burma. 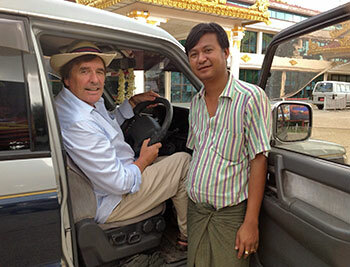 This second lengthy visit to Burma was to prove to be a real grass-roots trip of exploration. Communication has not been easy. Mobile phones don’t work, anywhere, in Burma, and in Bagan you can only make a phone call by standing at the reception desk of the hotel and waiting for an international line… in my case, the visit at the end of the rainy season was to prove somewhat fraught, there were no phone lines, and it goes without saying that the entire region of Bagan was without internet links. Paying by plastic is also unheard of… credit-cards just about everywhere is impossible, it proved just too modern-age for what is unquestionably one of the most charming, friendly, character-laden hotels I have ever stayed at. It’s dollars, in cash, in Bagan – and most other places outside Rangoon. Like the roads, some of the places chosen for our stop-overs are like a step back in time. For me, it was like going back to the mid-1980s when I was a regular visitor to the hill-stations of India’s Himalayas as a competitor on the Himalayan Rally. Lack of communications can be frustrating, but there are always compensations, you’ll get over it - try racing around the brick-paths having commandeered one of the little electric golf-carts... they're good fun to drive, electric engines giving you maximum punch from take-off, and the handling on wet bricks sharpens up your reflexes. What about the other hotels, you might ask. All I can say is that given one of my first concerns was decent overnight car-parking, with security, the hotels I have found so far really do stack up to be as memorable as the driving. In Rangoon (or is it Yangon, as on some of the newer maps, but our Route-Book however sees no reason to depart from tradition so it’s Rangoon for us), here I sought out a lovely old building that originally was built in 1934 as the British Boat Club. Membership of the Club was as would expect – very exclusive, which meant that no local Burmese were allowed membership and a local resident could only go through the teak doors as a special-guest. This quaint Colonial custom which you will no doubt describe as downright racist, was rapidly reversed, you will be pleased to hear, in 1948. On Independence, one of the first changes was to see the Burmese taking over the Club, so that only Burmese could be members of the re-named Burmese Boat Club. Johnny Foreigners, and that means the British, could now only be admitted as a special guest, and when only accompanied by a Burmese local. During this period, most foreigners including lots of the British, just packed up and left – leaving behind some lovely Colonial architecture, which today stands alongside gold-leafed temples in busy traffic-gridlocked streets. The Club-life faded as quickly as the gin ran out, but the building now took on a more serious sense of purpose when it was turned into Burma’s natural-history museum. Poke about the tall palm trees and clamber through the thick vegetation of what was once the rose garden, and you will suddenly find yourself knee-high to a dinosaur. Today, this place is hotel, and on the short-list of ‘possibles’ for us, not because of its history, or because drinking a gin-and tonic in the threatening glare of a T-Rex makes for an unusual experience, but because of the three good restaurants (they do a good steak with pepper-sauce, which goes down well after a week of Thai-curries) and the car park is the right size. It gets better. Most of the bedrooms are well away from the street, so, apart from Richard Clayderman’s piano playing away down the bedroom corridor in the lift, the rooms are an oasis of quietness, far from the noisy street outside. See? We even sweat the small stuff, and given the Devil is always in the detail, quite right too. Americans won’t like the lack of fluffy-towels, and the bath-plugs no have a water-tight fit, so we still have some work to do. Driving around Rangoon, you can easily spot the big houses where the British once lived - where they would hand down their orders for governance of calm order, while teaching the locals the real meaning of bureaucracy and paper-work… the long grass lawns are still neatly trimmed, and still with a cow pulling the mower, which means no noisy engines on a Sunday morning, and as the animal then eats the cuttings, everything is left nice and tidy. I came away with a line on the map firmly agreed with officials, the border with Thailand sorted and agreed, letters of welcome had been tapped out before my eyes on an old Remmington typewriter, some of our hotels are now booked and agreed, menus have been discussed, security issues resolved, overnight car parking paced out, and things like driving licences, third-party insurance, the permits for satellite phones, medical matters including locating hospitals, and temporary import-papers for our cars are all sorted. So, all in all, it has been a very good trip. Many boxes have been ticked by the Rally Organisation as well as Government officialdom. But just as I was about to get on the plane to go even further east to Bangkok, the phone rang. Would I like to go to a meeting, please, to discuss the northern border with Thailand, as this option opens up a more interesting road to Mandalay? …Please? There was just time to dive into another rusty old taxi, and thread my way through the streets for yet another meeting, this time over an excellent vegetable curry and rice, before going on to the airport for the Thai-Airways flight to Bangkok, which nicely hooks up with the midnight connection with the British Airways bed to Heathrow. It had been a very long day. However, this route-change suggestion now means having to go back to Burma, in a few months’ time. This final meeting was to prove the most tantalising, fascinating and useful meeting of the lot. There was just time to poke a note through the big brass letterbox of the British Embassy, before worrying about the traffic and getting to the airport on time. The battered old Samsonite briefcase that once contained the small emergency-rescue kit given out to drivers on the 1986 Paris-Dakar that since then has been my regular companion, following me around on rally-recce trips since 1987, is in the locker above my head as we are now once again flying home together. Briefcase and I are now over the Himalayas, about to fly over the mountains of Afghanistan’s Hindu Kush, we are both at 30,000ft. OK, the case is actually three feet higher, and packed with minutes of meetings, maps, John Spiller’s route-notes from his drive through Malaysia and Thailand and brimming with ideas for what looks like being a truly fascinating adventure-drive. Of all the countries rallying has taken me to, nothing quite prepared me for what I found when I took the long-haul flight on Thai Airways to Bangkok, and then the onward connection to Rangoon, currently there are no direct flights to Burma. Vivid green paddy fields with hard working farmers planting the next crop of rice, stretch for miles as you drive down remote country roads, friendly waves from crowds of Buddhist monks in their saffron robes welcome you as you pass by… and what’s this coming up? A boy on a bike with a large box on the front – an ice-cream seller, out here, miles from anywhere! Every turn of the road is full of surprises. One of the most amazing aspects of Naypyidaw, Burma’s new capital, the only capital-city in the world that is not linked by an international airline, is that the civil servants who staff all the various Ministries were only told about this secret-city on a Friday afternoon. The information came in a letter telling them to go home and pack their bags and start moving... they were to report for duty in their new office, having moved house, on Monday morning. I discovered a city that appears to have been built in secret. The workers were told they were building a new military base – which may explain why many of the roads are vast eight-lane highways of white concrete that glistens in the sun… presumably they thought they were building aircraft runways. When you arrive, you walk through a brand new airport - absolutely shining new, it’s twice as big as Terminal Five at Heathrow, and everything sparkles... the polished marble floor is slippery because the only other people in the airport are the floor polishers. It was totally empty - not a sign of any other travellers. Walk out to the taxi rank and all the drivers have been sitting on the grass waiting for the small turbo-prop Beechcraft to land from Rangoon, and there is a sudden scramble to pick up the dozen passengers. I travelled from Rangoon with Anthony Preston (not the rally man, the Second Secretary from the British Embassy). "You will be mighty impressed when you get down the road," he said, "it’s like Switzerland. Not a spot of litter. Every roadside lawn is freshly cut and watered overnight. The place is spotless. There is no traffic. If you go into the centre note the different coloured roofs on the houses… each Ministry has its workers in blocks with different coloured roofs, depending on what Ministry they work at." True enough, I was then driven down immaculate avenues of trees just coming into bloom, and later that night, went out to explore along streets with different coloured roofs. One ministry is yellow-topped housing, another dark red, and over there it’s dark blue... further on, light green." Travelling around Burma is like nowhere else. Is it safe? One evening, I took a taxi into town to see the centre of the new capital, and strolled around the bus-depot at mid-night… again, friendly faces, eager to meet anyone from the West. It was busy, and no different from strolling around the bus depot in Sunderland. The mission on this first trip was to make contact with the heads of the various departments that will authorise the Road to Mandalay. The Minister of Tourism, The Minister of Sport, the Foreign Ministry, the chief of traffic police, all were on the agenda during a hectic week. Again, even the meetings were full of surprises. Walking up the flight of stairs to the Ministry of Sport, you walk through offices where girls sit behind piles of paper, towering over their heads. Not one computer between them. 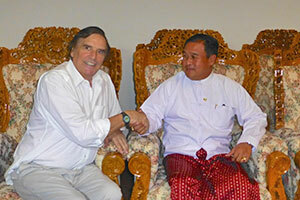 Meeting a Minister in Burma is to be treated as a V.I.P. There were rows of assistants, and even a local TV crew and a photographer to record the occasion. Notes are taken, lots of hands shaken, and everyone bows and thanks everyone – and the bottom line? Why can’t the rally come this year? What more can we do to help you? The answer is yes… now what is the question? Rarely have we visited a place and pushed at so many half-open doors to be met by eager support keen to make things happen. The roads? You may well ask. I travelled down empty roads, with the odd slow-grinding truck left over from WW2 on mile after mile of bumpy tarmac, rippled by the hot sun, lined by lush green countryside – and every few miles, passed a golden temple. The temples are everywhere – even out of the hotel bedroom in the centre of Rangoon gives you a view of at least five golden-spires. Driving in Burma is a reminder of what the foot-hills of the Himalayas were like 30 years ago. Before flying back to Bangkok, I had time to take a look at one or two dirt roads that run out between the fields – I left with a strong desire to go back and spend more time checking out our draft routes, as clearly Burma is brimming with potential. Forget the eight-lane highways, and the excellent, smooth tarmac, I’m keen to go back and get out into the more rural parts – Burma promises to be an unforgettable experience. I flew back to Heathrow having met a sea of welcoming faces among the Government’s officialdom, all keen to make the first rally to cross their frontier a great success. It takes three days travelling to reach Burma’s capital - and then after two days of endless meetings with Ministers and Officials you come away with the words "we want to help you" having been repeated over and over again. Nothing is too much for a government eager to make things work - and reach out Westwards.